I finished it, I finally finished it!! After nearly four months, I finally finished this book. Part of the problem, no doubt, is that I listened to it on audio rather than actually reading it, and it’s not as easy to find opportunities to plug myself into my iPod as it is to just sit down with a book. Anyway. I’m just going to be upfront: I did not love this book. That seems almost sacrilegious to say, but there you have it. All these months, I’ve caught snippets of conversations, and by all accounts, everyone who has opened this book has fallen in love with it – and then it went and won the Pulitzer Prize! I’m absolutely sure that I’m missing something, but I don’t get all the accolades. At the heart of the story are a boy and a stolen painting. Thirteen-year old Theo Decker and his mother dash into the Metropolitan Museum of Art one rainy day when they have time to kill before a disciplinary meeting at Theo’s school with the principal – so, for all intents and purposes, he and his mother would never have made the chance visit to the museum that day had it not been for Theo getting into trouble at school. During their short, unplanned visit to the museum, the museum is bombed by terrorists, and Theo, after coming to in a scene of destruction and carnage, escapes the building with a small masterpiece painting – his mother’s favorite piece of art – that was blown from the wall, as well as a ring given to him by a dying old man. His mother is among the casualties of the bombing. The book spans the next fourteen years of Theo’s life, in which the ring leads him to an elderly antique furniture restorer/dealer and a young woman whom Theo pines for. He bounces from home to home – first, the wealthy and dysfunctional family of a school chum, then his alcoholic absentee father and his floozy girlfriend, and then the furniture dealer who takes Theo under his wing when Theo has nobody else and nowhere else to turn. Through all of this nomadic moving around the country, Theo lovingly hauls along the painting he took from the museum, which is both a connection to his beloved mother, and an albatross by which, as the years go by, he feels more and more trapped. He forges a friendship with a Ukrainian immigrant his age as an adolescent, and the friendship, though destructive in many ways, is also a lifeline to Theo. 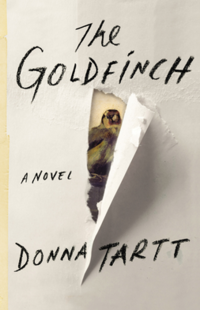 The Goldfinch is intelligently written, and the plot takes many twists and turns. It held my interest, but in all honesty I felt like it was two or three hundred pages too long. I also had trouble with the extent of the drug use in the book, which played heavily into the story but seemed gratuitous and unnecessary – and it made it difficult for me to like and sympathize with the characters as much as I might have otherwise. Call me a prude. But seriously, don’t take my word for it. People everywhere apparently love this book, so go read it yourself. Just goes to show: I may love to read, but that doesn’t mean that I necessarily get or appreciate great literature. I’m betting this will be adapted for the big screen sooner or later; I would go see the movie. LOL- I have been waiting to hear what you think of this! I’ve been on the waiting list at the library for the audio (works better for me to get chunks of reading done in my commutes) and after everyone’s gasping about it I’m at a loss. I’m only like 3 or 4 cds in to it- but usually by now if a book is going to grab me it would have. I’ll finish it, but I am by no means riveted. I was assuming it was because I hadn’t come down off of my The Fault in our Stars high yet. I have a really hard time when I’ve thoroughly enjoyed a book and the characters to move on. TFIOS and Wonder and Out of my Mind have me convinced that my mind is really only enthralled by juvenile literature….I’m also still sooooo hung up on the BBC/PBS show Sherlock and am wanting to go back and read the orignals- well listen to them on audio- and with my Benedict Cumberbatch teenage fangirling I watched his HBO mini-series- Parade’s End and it struck me that the book might be lovely since so much of the depth of it seemed to be in these Victorian looks between the characters. Unfortunately for The Goldfinch my turn with it came up in the midst of my wanting to be mentally occupied other places- but if I give it back without reading it, it will be ages before my turn comes up again. I want to buy Out of my mind for the girl’s school libraries and their teachers!